The “modern farmhouse” style continues to be a popular trend. The design style blends some of the best elements of industrial, rustic and modern design that can create a casual, laid-back elegance. The style feels approachable, rather than stuffy, and can give a home that warm, inviting feeling. It seems to be a perfect match for a city like Austin that prides itself on being laid-back, casual and cool. Our team had the perfect opportunity to cozy up to the relaxed style in a new build in South Austin. The exteriors of the home had the signature modern farmhouse look with a crisp mix of white and black. As the construction on the home neared completion, our millennial clients contacted our team to design the interiors. They wanted the furnishings and decor to echo the architectural style of their home. They preferred a black and white color scheme, which is another signature element of modern farmhouse style. Black brings in a sleek, modern elegance, while white and other natural finishes brings in the earthy, country elements. We will reveal several of the main spaces of this South Austin Modern Farmhouse on the blog. Today we will start with the modern farmhouse inspired dining space. The dining room feels inviting and approachable with a mix of neutrals and textures. The furnishings also had to be appropriate for the young couple with their first born on the way. 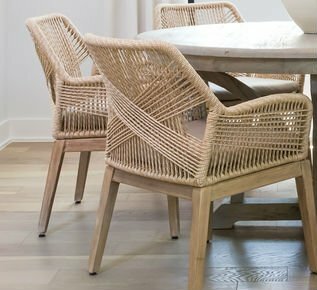 A gray wash round dining table is accented by rope frame chairs in a natural sand finish with gray seat cushions. The rope detail brings in stylish texture and pops in the primarily neutral space. Here is a close-up detail of the chairs that help the space look refined rather than rustic. The charcoal grey oak buffet contrasts effortlessly against the white walls with a neutral canvas art piece for even more modern appeal. On the opposite wall, a gallery of framed black and white photos give the space a personalized touch. When working with such a neutral color palette, especially in the farmhouse style, texture is key. Accents with texture can add a lot of depth to space and can help it from falling flat or looking too note. 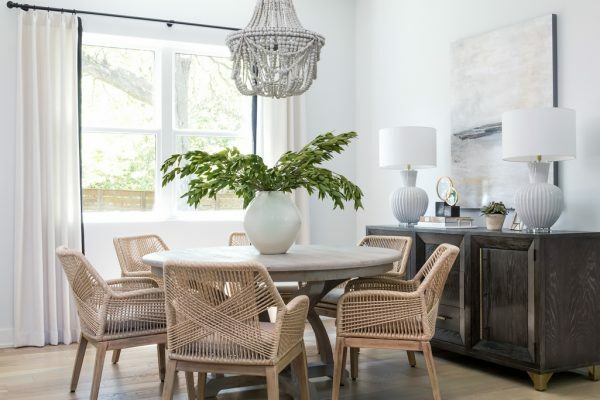 With this in mind, ribbed white ceramic lamps and a gray beaded chandelier were selected to add even more interest and texture to the dining room. White stationary draperies with black velvet trim frame the window and help soften the space even more. The modern farmhouse interpretation does not have to be rustic. It can still be soft and elegant, while still staying true to the approachable, and laid-back tenants of the style. Next week we will tour the living room, which has a fun, custom twist. 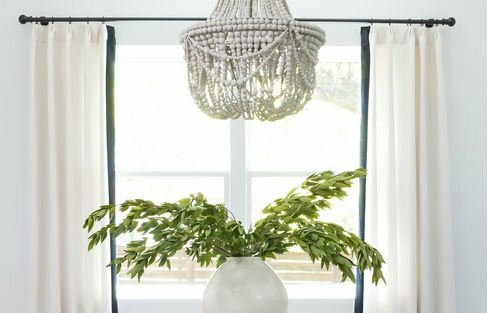 I like the chandelier, what is the price and where can get one? Hi Chris. You can purchase it directly from Pottery Barn. It is the Francesca Beaded Chandelier! Where are the white ribbed lamps from? Hi Marissa! You can order them through the store! Call us at 512-342-6899 or email us at info@heatherscotthome.com for more details.